In this topic you will learn how to capture poster and thumbnail images using the Media module. For videos that are uploaded to Video Cloud, poster and thumbnail images are created automatically by taking a snapshot from the source video at the midway point. Video Cloud will try to capture the image from the highest quality, playable MP4 rendition. If there are no MP4 renditions, it will next try HLS renditions and then DASH renditions. Note that if you ingest your video using a custom ingest profile that does not include any HLS renditions (only MP4 renditions), the poster and thumbnail will not be captured during the transcoding of the video. You can still capture them using the process described in this topic. Client-side image capture takes a frame of the largest rendition the browser can play and sends it to the Video Cloud ingestion process with the poster and thumbnail dimensions specified in the default ingest profile. If those profile dimensions are larger than the frame we were able to capture, the image is not resized or scaled. If they are smaller, the image is scaled down. For information on increasing the quality of poster and thumbnail images, see Increasing the Quality of Poster and Thumbnail Images. It is also possible to upload other images to use as the poster and thumbnail. If image capture is not available, the image capture button will be disabled. Click Media in the navigation header to open the Media module. Click the link for the video you want to edit. Using the preview player at the top of the page, play the video and pause on the frame you would like to save as the poster/thumbnail image. You can also scrub across the player progress bar to jump to another frame. The preview player at the top of the page will display the current video frame. 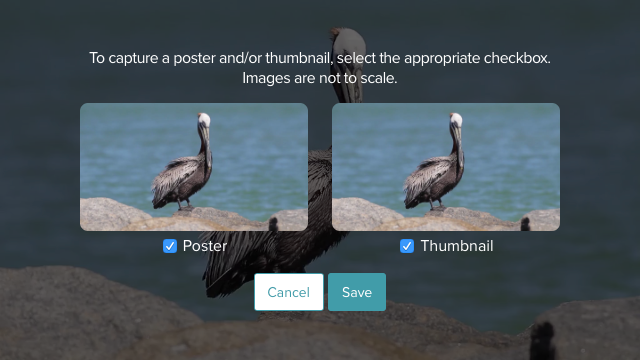 Use the checkboxes to select whether new Poster and/or Thumbnail images will be captured. Click Save to save the new images. The ingestion system does not allow concurrent jobs on the same video. Therefore, if you attempt to capture images while the video is being ingested or retranscoded, the image capture will fail.